“The word of the Lord came to Jonah son of Amittai: ‘Go to the great city of Nineveh and preach against it, because its wickedness has come up before me’” (Jonah 1:1-2). It’s hard for us to grasp how shocking this must have been for Jonah. In Jonah’s lifetime there was one world superpower: the Assyrians. The Assyrians were known for their brutality. They had refined the art of torture in a way that is recorded in history. It would make your hair stand on end. They were the terror of Jonah’s time. Nineveh was one of the major Assyrians cities. The prophet Nahum describes it as “the city of blood, full of lies, full or plunder, never without victims” (Nahum 3:1). This was not a place you would want to visit. If you saw that in a vacation brochure “city of blood, full of lies,” you would not go there. Put yourself in Jonah’s shoes: This man has a successful ministry among God’s people. He was known for prophesying good things like extending the borders of Israel. He has a good life in a good place, doing good work. And now the Word of the Lord disturbs his comfortable life. Our culture says “live your dreams,” but God has a way of disturbing our dreams. We all have hopes and dreams of what our lives will be. We plan our families. We plan our futures. We plan our finances. Then God breaks into the plan: A child is born, a loved one dies, the market crashes, you lose your job, and suddenly your life is not going according to your plan. When God stepped into Jonah’s plan, his heart was revealed. Jonah’s self-centeredness was hidden under the surface of his successful ministry but his “I want a comfortable life, God,” was exposed when God called him to leave something old and to start something new. “But Jonah ran away from the Lord and headed for Tarshish. He went down to Joppa, where he found a ship bound for that port. After paying the fare, he went aboard and sailed for Tarshish to flee from the Lord” (Jonah 1:3). your right hand will hold me fast” (Psalm 139:7-10). Jonah is dodging a God-centered life: He planned where he wanted to live and what he wanted to do. When God disrupted his plan, he quit. If your plan becomes more important than God’s plan, you cannot live a God-centered life. What if God wants you in another place? What if God wants you to do another kind of work? What if God has another purpose for you for the sake of people who need to hear the Gospel? The world wants you to believe that everything is stable, secure and permanent. But it is not so. The home that you live in is yours for a time. The work that you do is yours for a time. The people you love are yours for a time. “What is your life? You are a mist that appears for a little while and then vanishes” (James 4:14). “Teach us to number our days that we may gain a heart of wisdom” (Psalm 90:12). Why Jesus and not the other gods? WARNING: CONTAINS INFORMATION THAT CAN BE PROVOCATIVE TO SOME! Personal advision to leave my page can be necessary of the message can be hurtful! Now I am going to write what is the differences of all this religions. I am a believer of Jesus and I will stand for it and not ashamed of it. I resist all kinds of religious claims and I wish there were no religions at all. I wish there were no groups or sects that would make a person be comforted where they would belong. and we support Israel. We love Israel and that the faith draws us towards Judaism. and we love the jewish nation. ברוך השם. But the fact that nowadays, there are thousands of religious groups, sect, and organisations claiming to be following Jesus that uses the weakness of people to gain power and money. by this, Many had been dissolved by the system of using that name and since the begginning of history, it had been used to conquer many nations that left shattered life and lost souls.. And this I hate so much. Jesus came to the world not to be confirmed by peoples suggestions or claims. But by the power of Gods Spirit sent down to redeem the the jewish first and then the foreigners or unbelieving nations in the world. Jesus carried the sin and pain of every mankind to redeem all from the destruction of eternal damnation. Sin of idolatry, jeopardy, sexual behaviour apart from marriage, liars, sorcery, mediums, thief, adulterers, unrespectfulness towards parents. All of this are the clear sin of physical manifestation which starts in the mind of person. and before it goes to the mind of a person, it starts from a trigger of the devil. So Jesus carried all of this sin upon him that we all be redeemed and be reconciled to God. ( for as Jesua said he is like of Abraham) and see he lived a life we must follow. An example of being righteous and humble and meek. Gracious and kind. Loving and gentle. Now, to be saved is to believe, that He after all this shame, he was put to death to suffer from all our transgressions and be the living sacrifice to God and be a escapegoat. to be the carrier of all our uncleanness and filthiness that through the blood of Jesus be cleansed. And upin the stake, he died. with all his breath he gave to God and said. It is finished. On the third day he rose again to show that God can raise him to life because it is His will. There we must repent. Regression is not enough. but to sincerely admit our transgressions and never return to them. then we can call upon God that He may forgive us. Now we believe, although we dont see yet. The next step is to be baptised in the name of God, through Jesus Christ by the power of the God's Spirit. After believing, then we have to take our step to be baptised to be cleansed and washed away. be emptied from all the dirt of our conscience and our soul will be as white as snow. Then we shall be filled with the Holy Spirit to proclaim the power and might of the ONE TRUE GOD and He will perform the changes and miracles in our lives or through our lives. that we can do good not because we want something back. But that we do good because as children, Our God is good. That we do what is right and just because it is our responsibility to shed light in darkness as pur Father in heaven that manifests His righteousness and mercy upon us all. and we will live in righteousness and will not live in sin anymore nor darkness has anything to do with us.. BECAUSE God lights the path we walk on by while people standing by.. seeding the truth to salvation. After all this message. i have given you the Gospel.. I want to share the differences. In Buddhism, tantra is the use of rituals, symbolism and yoga practices to evoke experiences that enable realization of enlightenment. The most common practice of Buddhist tantra is to experience oneself as a deity. Doing right in buddhism is also expectation to receive good karma. the saying "what goes around comes around"
In Islam. Jesus is like a prophet written in their Qur•an. God does not have a son but indeed Jesus is written and his mother is Maria. Jesus is just an ordinary "good" person and that jewish and christians are infidels. Jesus "was"like a prophet but Mohanmed is a BIG prophet. therefore the existence of Jesus is neither exist or non-existance. Nevertheless Mohammed is the main example of their faith. Mohammed believed to received revelations from God through an angel and therefore his example is a subscription to follow. But the peoples of the book are infidels because they dont believe in same god of islam therefore infidels must be eradicated. Prayers are done 5 times a day plus a prayer every friday. in islam, it was likely to Buddhism when we thibk of prayer beads. they got that too. In Judaism. Jesus is Yeshua in hebrew and is jewish in blood. grown up in Nazarene to Mary and carpenter Joseph. In Jewish judaism, Jesus is a blasphemer and therefore deserves to be hanged on a stake for claiming himself as God. Nevertheless his miracles became to some both jewish and greeks an amazing thing that happened but towards jewish traditional law it is mere a lie. fact: in Judaism, this is the root of The true faith in Christianity. in fact Jesus led the people to believe in the true ONE GOD and put away the idols. Three times a day is a daily prayer and the shabbats gathering. and science has evidence yet the breath of life is not enough as an evidence for them but mere a fact it is evolutionized. the basis of atheism are scientifically proving everything and all things must have logic and evidence which if things unreported or non evidence can be refuted or taken down. There are so much more of the differences why Jesus and not other gods but i am so tired to compare it all. Lets make a conclusion that Jesus left and the building stands still..  by the way. it should not be like that. life as a Christian should reflect the ONE WE SERVE AND LOVE ABOVE ALL.... GOD... of Abraham Isak and Yakov..
now as I have shared the things I have learned, I love reading and sharing and I want that you if you claim yourself a follower of Jesus. Read your bible and you will see that Jesus did not introduce any religion at all but merely showed the way to the Father by living his life and showing the disciples the character of perfectness and meekness. Love Israel. For a long time ago, I was lost because of the good things of the world and yet during these years I have known God. I was misled by people's different voices about how to look at myself. But the day I woke up that the world has lied to me and people are selfish in themselves, I realized that I'm heading towards the valley of death. Of all I accomplished and worked during my life meant nothing when I was alone in a room because I felt emptiness and nothing else could fill it. I have tried different things to find peace .. but I did not find the happiness and peace that fills these empty spaces ..
Then I called on God and at the deepest of my heart I found love that is true. For once, I felt I was worth and loved. Love that can not compare between me and you. Love greater than this velvet and peace that draws me to joy, hope and life. Through the years, God raised my heart for compassion and mercy to people who used me, hurt me. So I forgave them like leaves that fall easily on the tree in the fall of autumn. Likewise, I asked forgiveness to people whom I had also hurt. I was changed, a new person who needs no confirmation from others but lives life with God and does justice and follows the word in the scriptures. I tell you who are misled by your own beliefs that it can not save your empty days. Even though you have accomplished a lot in life, that day will come when everything will be an empty can before God and you must find the freedom that only you can get through the liberation in the name of Jesus. God can save you if you turn away from anything contrary to God's law. Yes, His law to live morally and live free from the sin of the world. You love your God, love others like yourself, do not steal, do not lie, do not make false statements about other people, be true to your wife or husband, do not be jealous for the lives of other people neither material nor man or wife , do not kill others or do not even think about their destruction. If you suffer from mental ill health like boils in your thoughts and hearts, if your inner is captivated by bitterness and anxiety. There is freedom in the name of Jesus. I do not say that the Church or the priest can deliver you, neither of these can free you from your boils. God does not hurt, He is gracious, He is loving to those who seek Him. However, he is hidden from people who have already denied Him. His anger is upon people who relieve their own power and will die without hope and joy ... !! before it is too late. Come and seek Him while you find Him. Do not think about the church or pastors because they are not the ones you will face before the day of judgment. Repent and change your life. Have mercy for your life ... I beg you .. Do not be hard in your heart. There is a way out to freedom, and it is not religious collections, nor material, nor fortunate mediums or seasons. Ett tag blev jag vilsen på grund av världens goda ting och under dessa år, ändå har jag känt Gud. Jag blev vilseledd av människors olika röster om hur jag ska se på mig själv. Men den dagen jag vaknade att världen har ljugit för mig och människor är själviska i sig hade jag insett att jag är på väg mot dödens dal. Av allt jag åstadkommit och jobbat under mitt liv betydde ingenting när jag är ensam i ett rum för jag kände tomhet och ingenting annat kan fylla den. jag har provat mig fram till olika saker för att finna frid.. men jag hittade inte lyckan och frid som fyller dessa tomma rum..
Då ropade jag på Gud och djupt i mitt hjärta fann jag kärleken som är sann. För en gångs skull kände jag att jag är värd och älskad. Kärlek som kan inte jämföra mellan mig och dig. Kärlek som är större än det här världen och frid som drar mig till glädje, hopp och liv. Genom åren Gud väckte mitt hjärta för medlidande och nåd till människor som utnyttjat mig, skadat mig. Så jag förlät dem som löv som lätt faller på trädet vid höstens gång. Likaså jag bad om förlåtelse till människor som jag hade också skadat. Jag blev förändrad, en ny människa som behöver ingen bekräftelse ifrån andra utan lever livet med Gud och gör rätt och följer ordet i skrifterna. Jag säger till dig som är vilseledd av dina egna uppfattningar att det kan inte rädda dina tomma dagar. Även om du har åstadkommit mycket i livet, den dagen kommer att allt blir en tom tunna inför Gud och du måste finna den friheten som endast du kan få genom befrielsen i Jesu namn. Gud kan rädda dig om du ska vända dig ifrån allt som är emot Guds lag. Ja, Hans lag om att leva moralt och leva fri ifrån världens synd. Du ska älska din Gud, Älska andra som dig själv, inte stjäla, inte ljuga, inte skapa falska påståenden om andra människor, var trogen mot din fru eller man, var inte avundsjuk efter andra människors liv varken det är materiellt eller sin man eller hustru, inte döda andra eller inte tänka ens en tanke om deras destruktion. om Du lider av psykisk ohälsa som bojor i dina tankar och hjärta, om ditt inre är fängslad av bitterhet och ångest. Det finns frihet i Jesu namn. Jag säger inte att kyrkan eller präst kan befria dej, ingen av dessa kan befria dig ifrån dina bojor. Gud skadar inte, Han är nådig, Han är kärleksfull till de som söker Honom. Han är dock gömd för människor som har redan förnekat Honom, Hans vrede är över människor som förlitar sin egen kraft och kommer dö utan hopp och glädje... !! innan det är för sent. Kom och sök Honom medan du finner Honom. Tänk inte en tanke om kyrkan eller pastorer för de inte dem du ska stå inför domens dag. Omvänd dig och förändra ditt liv. Ha nåd för ditt liv... Jag ber dig.. var inte hård i ditt hjärta. det finns en väg ut till friheten och det är inte religiösa samlingar och inte heller materiella och inte heller förhäxade medium eller seanser. Looking on peoples, I see things I must give gratitude..but to whom? that was preferably my question.. after many years, my answer is .........God! In some cases, I know that things can happen and they might be unbearable. But still there are things to be thankful of because it is a testing of everyones character to see where do they lay their heart upon, and a testing of their consistency towards justice, mercy, compassion and patience - all in all = LOVE. 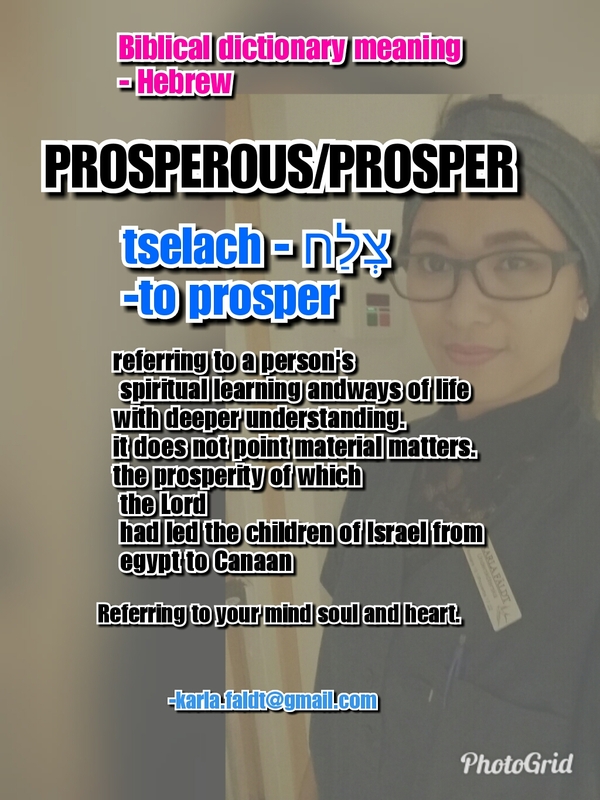 Over the years the word "prosper" has been used and abused by many. it had been referred to materialism and wealth, although it speaks differently according to the scriptures. I would like to share that my understanding of it means the richness of succeeding in understanding and wisdom. A life changing knowledge that reveals obedience and full respect to someone that you truly love and someone ready to teach you all along. it will be bumpy along the way but I assure you that you will make a progress in your character, in your lifestyle., and even in your speech. for who would listen to you if your speech is not gracious and merciful. who would believe you if your life is not a mirror of good example. and who would like to hear you if your character ruffles pride? 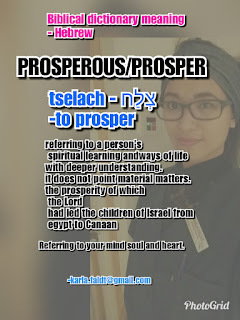 the scriptures has hidden messages, as we look at the life of the children of Israel departing from Egypt to Canaan, they had a lot of struggles. their whole being was at the process of refining. m 1 Chronicles 22:11: "the LORD be with thee; and prosper thou, and build the house of the LORD thy God,"
1 Chronicles 22:13: "Then shalt thou prosper, if thou takest heed to fulfill the statutes and judgments"
1 Chronicles 29:23: "instead of David his father, and prospered; and all Israel obeyed"
2 Chronicles 7:11: "in the house of the LORD, and in his own house, he prosperously effected." 2 Chronicles 13:12: "of your fathers; for ye shall notprosper." there is a great deal of self- interest among many Christians, it’s easy to become disappointed or frustrated. I think every leader experiences this in some way. God remembers that your spouse or loveones are dust. You should remember that too. So grow in serving others and learn to be patient at all times. cherish the years and days by being kind. It will help you to grow in meekness. be deeply committed, ready for sacrifice, engaged with the missions of seeking righteous path, walking by faith, and living in full obedience to God. Publishing for Gospel, Faith, Journey, Family, People and Culture. Rights Reserved KF 2009. Watermark theme. Theme images by macroworld. Powered by Blogger.